Core product category leading in margin and sales growth, Storage & Organization consisted of portable files, archival file tubs and crates, desktop files, magazine files, index card files, and other storage products, as well as the innovative new Shelf Savers™ products. Unlike the other product categories, Storage often faced very different competitors within the various product sub-categories. While this fragmented nature to the category made for complicated strategy, Eldon managed to dominate the category by providing the greatest depth and breadth of line. The category was quickly expanding beyond injection molded products. With new metal and metal mesh products, Eldon’s areas of materials knowledge was expanding as well. While the Product Manager position was equally responsible for product line management, what follows below is a brief sampling of some of the more cutting edge products that were developed. Born out of consumer research, Shelf Savers™ became the solution for a problem as old as the first office supply… efficient organization of supplies within the office environment. Not just a new family of products though, Shelf Savers led to incremental growth for both Eldon and Eldon’s customer base by creating an entire new category of products within the industry. Eldon’s customers created separate catalog sections and “internet tabs” for “Shelf Saving Storage.” Learn more about the development of Shelf Savers here. 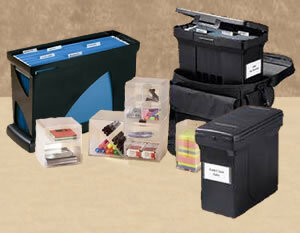 A unique new design to broaden Eldon’s file storage product line and strengthen the entry into file carts. This new design and price point would also carve out a new niche within the industry. Learn more about the Rolling Quick File. As part of the Pizazz™ family of products, the Global Quick File was a revolutionary introduction of features, going where no desktop file had gone before. Learn more about the Global Quick File. Building on the original Mobile Manager, the Project Manager & EZ Carry™ SimpliFILE® brought increased functionality to an already unique product. Learn more about the Mobile Manger product extensions. Building on Eldon’s first entry into file carts, the metal mesh version pictured here was the latest variation within an ever expanding line of products. Learn more about the Metal & Mesh Fold ‘N Roll Cart.